2018 Bowman Chrome Draft, 2018 Bowman Draft, 2018 Bowman’s Best and 2018 Topps Transcendent are all making their debut in this month’s Price Guide. 2018 Elite Extra Edition is partially priced below. 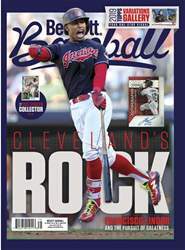 Full pricing for EEE is available now in the Online Price Guide and will appear in the Price Guide of next month’s Beckett Baseball. 2019 Topps Series 1 went live shortly before our pricing deadline, not allowing sufficient time to establish secondary market values. 2019 Topps Tribute and 2019 Topps Heritage are scheduled to go live in the weeks following our deadline. Be sure to check out the Online Price Guide on Beckett.com throughout February and March for pricing on these products - weeks before it will appear in the next issue of Beckett Baseball.